WOW! WOW! WOW! Really exciting news to share with you from my wonderful world of wedding photography! Those of you who follow me on Instagram (@JulietLemon) will know that I was recently in Portugal, where I had the absolute honour of photographing Alli and Matty’s stunning wedding at the gorgeous Quinta dos Vales. I’m thrilled to report that I won an award from the prestigious WedAward International Wedding Photography Awards, in their Thirty-Eight Collection. This was for one of my wedding photos taken on Alli and Matty’s big day. Nestled amongst their seemingly-endless vineyards in Estombar, the Quinta dos Vales wine estate was the perfect setting for their wedding day and, as you can see from this photo, we had the most glorious weather. 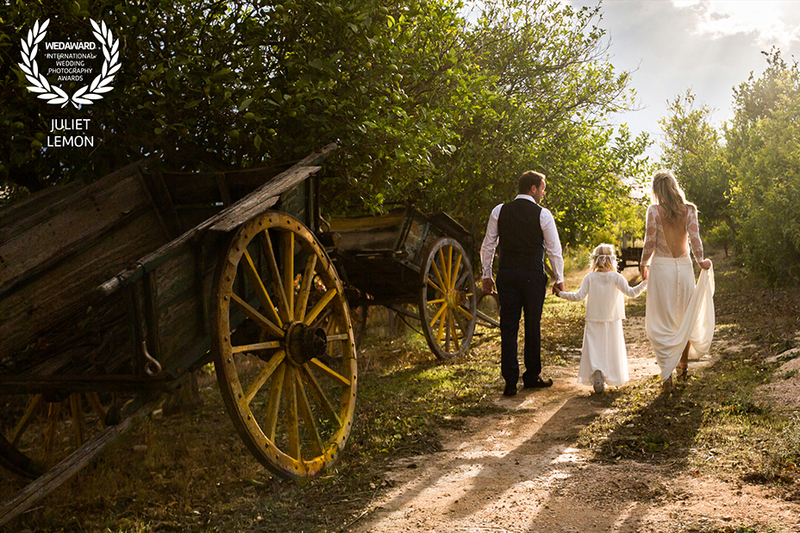 The newlyweds, joined by little Lettie, enjoyed some quiet-time during the latter part of their reception and went for a stroll in the vineyards. Unbeknown to the couple at the time, I spotted a super opportunity to capture this magical moment of the trio. I am absolutely chuffed to bits about the award and of course need to say a big THANK YOU and CONGRATS to the lovely newlyweds, who are now officially an ‘Award-Winning Wedding Couple’ – but of course, it wouldn’t have been possible without the help of little Lettie!